Excavator operators no longer have an excuse if they can’t make the grade. Machine-control systems now offer them several solutions to the problems of digging below grade or carving an uneven slope. The electronic solutions either take over delicate phases of an excavation or give an operator valuable, real-time indicators about where to place and move the bucket. Yet, please note: Skilled hands-on operators still are needed. “Maybe in a dozer system or a grader” can operators sit back for screen time with their phones, acknowledges Scott Crozier, director of marketing and product management for construction at Trimble Navigation. “On excavators, the operator still has to physically move the machine.” The point is, operators now have help. Trimble is the heavyweight in the machine controls industry. Founded in Silicon Valley in 1978, the company first focused on LORAN marine navigation before swerving into global satellite instruments. In 2002, Trimble entered an enduring business relationship with Caterpillar in the development of machine control technology. Other machine control and guidance innovators include Topcon Positioning, a Japanese company that dates from a 1932 optics firm and entered the machine control business in 1994. Another is Leica Geosystems, a Swiss company that traces its roots back more than 100 years to a survey instrument inventor. Each of these firms offers machine control systems for excavators. Hydraulic excavator customers can opt for a 2D or 3D system, as well as choose from “indicate” (manual) or automatic controls. This combination of options serves operators across a full range of excavator activities, as well as meets customer budgets and business plans. The 2D systems use strategically placed sensors to give operators a digital display of a bucket’s location and orientation. This is no small advantage. Even on compact excavators, the bucket-end of the stick can be far enough from the operator’s seat to complicate visual placement of a bucket’s cutting edge. Even more important, the control system provides essential depth data to keep a bucket on grade. Tilt buckets also can be controlled. This electronic input lets an operator perform such tasks as dig a utility trench at a uniform grade over relatively short distances, excavate footings and basement areas, level a jobsite for subsequent construction or produce a finished slope. Because small- and mid-size contractors frequently perform these operations, the good news is they can afford basic machine control systems, which start at around $10,000. Full-scale 3D systems — which can range up to $50,000 with all the bells and whistles — do all of the above plus give operators wider spatial awareness thanks to their GPS connection. The satellite link lets an operator know precisely where his bucket is as well as where his excavator is on a site. This big-picture is helpful on large projects where excavation activities are interconnected. With both 2D and 3D systems, operators can opt out and retain control of a bucket. This “indicate” option merely informs an operator where a bucket is in relation to a programmed grade. Operators still work the controls. The automatic option, on the other hand, gives control of the excavator’s hydraulics to the machine control system. 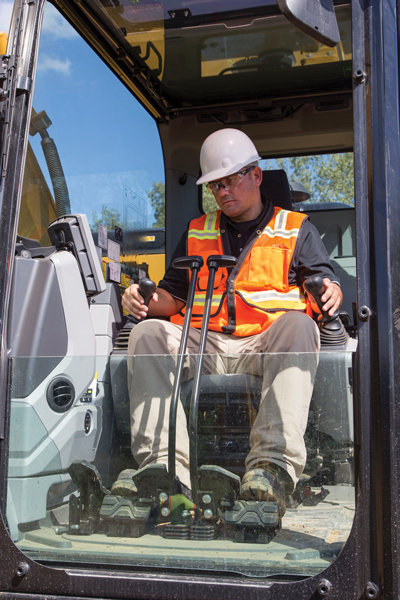 “Our depth and slope indicate-only systems on excavators have helped operators,” says Scott Hagemann, Caterpillar’s market professional for machine control and guidance systems, “but the finished product is only as good as the operator’s skill. With the advancement of the automated Grade with Assist system, the machine helps the operator get a quality finished product.” “Quality” means, for example, a finished trench within 2 to 3 centimeters of grade. Some of the systems are partially portable, too. Display and software components can be switched from excavator to excavator, some from one type of construction machine to another. Two years ago, Komatsu introduced its excavator model PC210LCi-10, which it called the “world’s first intelligent machine control excavator.” The manufacturer claimed the Topcon control system in the excavator lopped a whopping 63 percent off operating times compared to a manually controlled machine. So … 25, 35, 45 percent or more in efficiency — such numbers argue for weaning operators’ hands from joysticks in critical excavations. It is no surprise that heavy equipment manufacturers are offering customers factory-installed machine control systems. 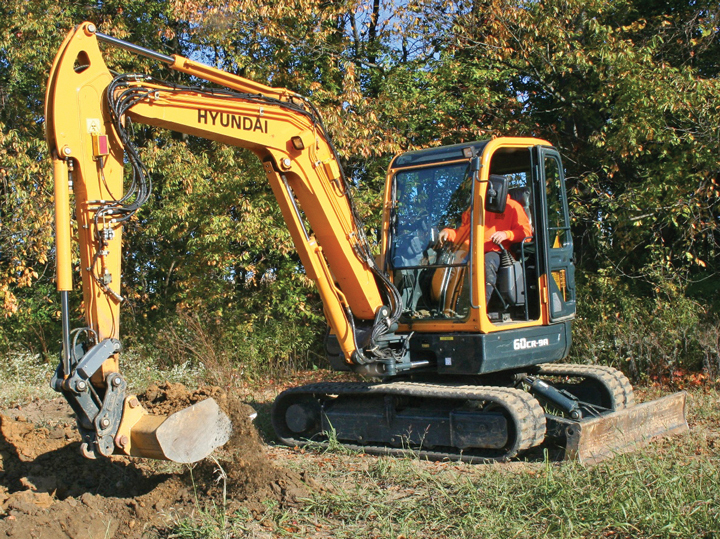 In November, Hyundai showed off a compact excavator with Trimble’s basic GCSFlex laser control system, another excavator with the GCS900 2D system and a third with the GNSS GCS900 3D system. “We are excited to help our customers benefit from using these advanced technology solutions,” says Corey Rogers, marketing manager for Hyundai Construction Americas. Doosan Infracore and Volvo Construction Equipment also are offering Trimble factory options. For customers wanting to get into using electronic controls on their excavators, there are several entry points. They can start with a system without GPS overhead. The less expensive units that are total station-based still provide accurate grade readings. And buyers debating whether to buy 2D or 3D systems have a third choice: They can purchase a 2D system and, if eventual need arises for broader 3D oversight, can easily upgrade. Hagemann says customers today most often use grade control in digging basements, footings and trenching. “But there are a lot of conversations on how they see it helping them complete 3D jobs, too.” A less obvious benefit of having excavator operators in fuller control of their digging by utilizing machine control systems is the elimination of most stake driving and grade checking by colleagues on the ground. Being at ground level in the vicinity of a clanking and spinning excavator is a potentially hazardous situation. Machine control systems can make a jobsite a less dangerous place. Giles Lambertson is a contributing writer to Compact Equipment.